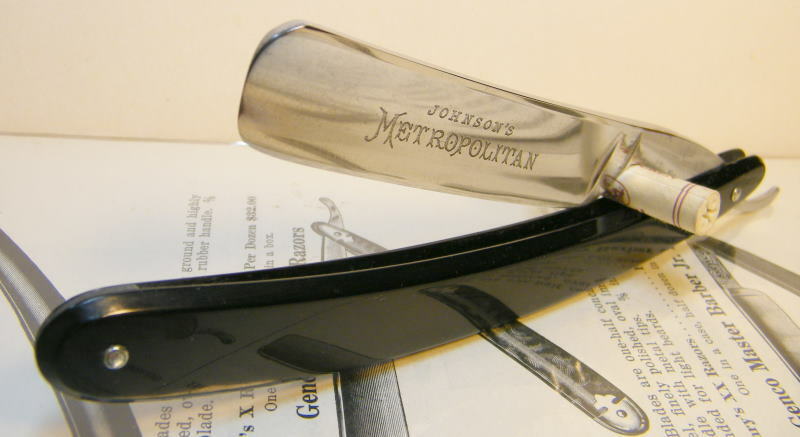 STRAZORS.com - all about classic razors - Christopher Johnson & Co., Sheffield, England. Christopher Johnson & Co., Sheffield, England. Christopher Johnson, who was born in Sheffield in about 1809, started his cutlery business (according to a trade catalogue) in 1836 in Howard Street. His early career, however, is obscure and the firm did not appear at the Howard Street address until 1854. Possibly Christopher Johnson may have been a partner (with Henry Johnson) in Webster & Johnson, a cutlery firm which operated between about 1839 and 1846 in Sycamore Street (William Webster). Christopher and Henry Johnson, merchant clerks, had been listed in a directory in 1833. By 1841, Christopher Johnson was enumerated in the Census as a merchant living in Devonshire Street. In the late 1840s, he moved to Gell Street and then by 1852 to Rockingham Street. In 1854, he was based in Western Works in Howard Street, with an outlet in Hatton Garden, London. Western Works was apparently so named because of Johnson's flourishing trade in the south-western counties of England. In 1859, he relocated to Portobello Street, which was to be the centre of the firm's operations well into the twentieth century. Johnson was essentially a merchant: but he listed himself as a steel converter and refiner, and a 'manufacturer' of files, tools, and a complete range of cutlery (including table and pocket knives). Johnson soon developed a liking for country life, partly one suspects because his business was so profitable. He brought new partners into the business, such as his nephew John Hibbert (c.1832-1908). In 1868, another partner, John Marshall, joined the business, and the title '& Co' was added. Marshall was born at Chapel Hall on 8 May 1836, the son of William Marshall of Calderbank, Lanark. Herbert John Johnson and Herbert William Johnson (presumably sons) were listed as partners in 1871, but this was a brief involvement. By 1871, Christopher Johnson had moved to The Grange, Carlton, Nottinghamshire, and withdrew from the partnership with Hibbert and Marshall in 1879. Johnson died at The Grange on 2 May 1881, aged 72, after 'a lingering illness'. Marshall and Hibbert now took over the business. In 1881, the firm employed 200 workers(according to Hibbert's enumeration in the Census). Hibbert himself retired from the firm in 1886 (he died, aged 77, on 1 June 1908, and was buried in Fulwood). Marshall became the owner of the business in the late nineteenth century, when the company operated at Western Works and Western Steel Works in Portobello, with a London agent in Victoria Street, London. Sheffield City Library Local Studies Collection has several trade catalogues and manuscript letter-books for this firm. These show almost every type of cutlery from table knives to hunting knives. A Johnson sample book, probably pre-1914, has photographs of sportsman's knives and farmers' knives. Hafted in buffalo, ivory and stag, the quality is self-evident. Many of these products were exported. Johnson, Hibbert and Marshall described themselves as 'Australian merchants'. In 1880, Johnson's won a gold medal at the Melbourne International Exhibition and then appointed an Australian agent, J. W. Bunby, who developed a flourishing trade in the 1880s and 1890s for Johnson's table cutlery and pocket knives. Besides steel and files, the firm sold plated-ware and registered silver marks in Sheffield in 1890 and 1903. 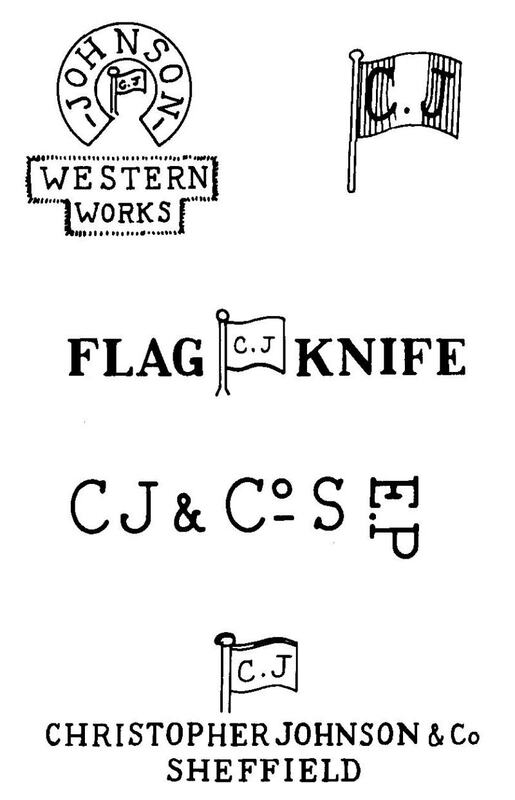 Johnson's trade mark - a flag enclosing his initials - was also well known in South Africa, where the firm won a gold medal at the Kimberley Exhibition in 1892. At the turn of the century, Johnson's were hard pressed to satisfy the demand from these markets. John Marshall died on 6 April 1915, at his residence Woodville, in Broomhall Park. He was aged 78 and was buried in Ecclesall. An extensive obituary in The Sheffield Daily Telegraph, 8 April 1915, discussed his work as chairman of the board of Sheffield Royal Infirmary, but hardly mentioned his business career. Marshall's son-in-law, J.M. Denton, took control of the firm and extended its trade in New Zealand. Christopher Johnson & Co. continued to trade in the early 20th century. It had become a limited company by 1939. But after 1945, the decline of its overseas markets, particularly Australia, hit Western Works hard. In 1955, it was bought by Wostenholm and Johnson's factory was closed.